With Dylan Farrow's allegations that her adoptive father Woody Allen sexually abused her when she was 7 years old back in the spotlight, old interviews and articles detailing both Mia Farrow and Woody Allen's sides of the story are rapidly resurfacing. Dylan's open letter in the New York Times, and the heated discussion surrounding her claims, prompted CBS to upload their 1992 "60 Minutes" interview with Allen, in which he denies molesting Dylan, and claims the allegations brought against him is part of Mia's plan to exact revenge for his affair with her adopted daughter Soon-Yi Previn. In the interview, Allen told correspondent Steve Kroft that several weeks before Dylan made her first allegations, Mia called him up and in the course of an "argumentative phone call," Allen claimed she told him, "I have something very nasty planned for you." Allen also said that on many occasions Mia had told him, "You took my daughter, and I'm going to take yours." Allen also claimed that Mia threatened his life. "She's threatened to have me killed and to kill me. And to -- and to stick my eyes out, to stick my eyes out, to blind me because she became obsessed with Greek tragedy and -- and felt that this -- that that would be a fitting, you know, vengeance," he told Kroft. During the interview, Allen dug up a Valentine's Day card he said Mia gave to him six months after the molestation allegations came to light, which can only be described as a frightening thing to receive. "She didn't send it to me; she gave it to me. And I said, 'Oh, thanks,' you know. And I went downstairs, I got into my car and I opened it up, and there ... was a very, very, very chilling Valentine, meticulously worked on," Allen revealed. "I mean, I -- one hesitates to say psychotically worked on -- you know, a Victorian Valentine and photo of the family, and through all the kids was thrust needles and a steak knife stuck through the heart of the thing." "Once my heart was one and it was yours to keep. 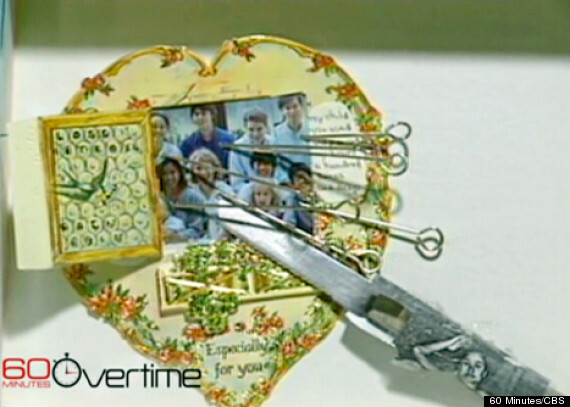 My child you used and pierced my heart a hundred times and deep," was written on one side of the card, and looking closely one can see that Soon-Yi's photo was taped around the knife that had been plunged through Mia's heart. Allen revealed he "got scared because, you know, that was -- that was one of the times that I thought, 'My God, this is really' -- you know to -- if you look at the thing, it's quite frightening." In the years since the allegations, Farrow made sure there are no more family photos with Allen pictured. Mia's son Fletcher Previn told Vanity Fair in October 2013 that he has Photoshopped Allen out of all their family photos and edited him out of family videos so none of them have to see him again. Jennifer Aniston and her mother, Nancy Dow, had been estranged for more than a decade after Dow gave an interview about their relationship in 1996. <a href="http://www.dailymail.co.uk/tvshowbiz/article-2036630/Jennifer-Aniston-heals-rift-mother-Nancy-Dow-hospital-bedside.html#ixzz23WyLMXKH" target="_hplink">According to the <em>Daily Mail</em></a>, the actress called her mother afterward, and told her that she'd never forgive her for betraying her trust. Dow's 1999 book, "From Mother And Daughter To Friends: A Memoir," about their rocky relationship, didn't make things any better. Aniston and her mother began speaking again following her split from Pitt in 2005. "Yeah, it's been really nice," she <a href="http://abcnews.go.com/GMA/story?id=1295274#.UCpkgxqe5Og" target="_hplink">told "Good Morning America" </a>of the reconciliation after nine years of estrangement. "It's been really nice. It's crazy what, you know, your life kind of being turned upside down will lead you to. ... For us it's ... it was the time, and it was going to happen when it was supposed to happen. So this is good. It's baby steps."